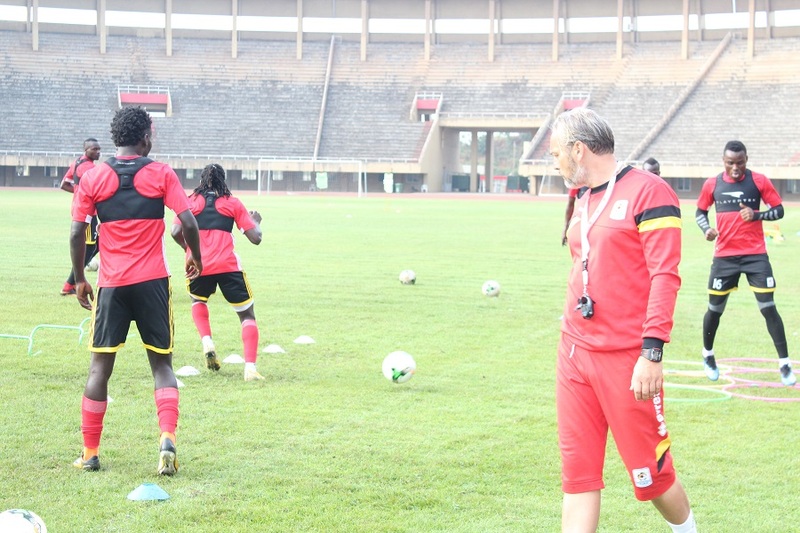 NAMBOOLE – Just days to their third AFCON qualifier, the Uganda Cranes have intensified preparations ahead of the doubleheader with Lesotho. On Monday evening, some of the 24 players who were selected to represent the nation on Saturday and next Tuesday, underwent their first training session in the residential set-up. A total of 16 players took part in the evening session including eight professionals. The Pros who were in attendance included Edrisa Lubega, Emmanuel Okwi, Godfrey Walusimbi, Denis Iguma, Murushid Jjuuko, Nico Wakiro Wadada, Joseph Ochaya and Allan Kateregga. Speaking after the session, Edrisa Lubega who was introduced in the last minutes of the goalless draw against Tanzania last month, emphasized that it is upon the players to prove to the coaches that they are worth the node on match day. “When we come out for training, we always give more than 100%. Said Lubega. “It is this same spirit that we want to display in the matches if given the chance to play but the decision on who plays is entirely left to the coach. “Our role as players is to train as hard as we can in order to prove to the coach that we are worth the node on match day. More professionals are expected to join camp in the next few days. The last bunch of pros yet to arrive include captain, Danis Onyango, Jamal Salim, Isaac Muleme, Hassan Wasswa, Khalid Aucho, Faruku Miya, Derrick Nsibambi and Milton Karisa. All the summoned eight local based players took part in Monday’s session and these are Goalkeeper Charles Lukwago, Sadam Ibrahim Juma, Timothy Awanyi, Patrick Kaddu, Isaac Isinde, Allan Kyambadde, Moses Waiswa and Tadeo Lwanga. Uganda Cranes takes Lesotho in a crucial doubleheader duel at Namboole and in Maseru on 13th and 16th October 2018 respectively. Lesotho are second on two points from as many games. The training sessions continue on Tuesday-morning (8.30am Gym session at Kabira Country Club ) and afternoon (1.30 pm) at Namboole stadium. Charles Lukwago, Murushid Jjuuko, Joseph Ochaya, Emmanuel Okwi, Godfrey Walusimbi, Edirisa Lubega, Allan Kateregga, Nico Wakiro Wadada, Dennis Iguma, Sadam Ibrahim Juma, Timothy Awanyi, Patrick Kaddu, Isaac Isinde, Allan Kyambadde, Moses Waiswa and Tadeo Lwanga.